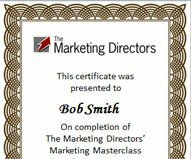 Our one or two day marketing communication masterclasses will help you plan and create effective marketing communication campaigns. Specifically you will cover the entire process from strategy development to create and critique ads. Who is this marketing communication masterclass for? Managers responsible for marcomms strategy and also those creating product or brand campaigns. First, learn ‘best practice’ methods and ‘top tips’ to plan, create and evaluate communications. Practice creating brand positionings and also advertising campaigns to improve your brand’s image, presence and sales. Gain confidence and skills to brief and manage agencies. Practice assessing, giving and also gaining feedback on comms ideas. Finally gain lots of new insights. These could help you make or save millions of pounds as well as boost your career! How to engage and persuade customers. Tips on creating a comms strategy for a product, service or organisation brand. How to brief and manage your agency and also to gain buy-in from your colleagues. Practical exercise to create a brand strategy and advertising ideas. Role play to assess adverts and ideas. The media and digital media landscape (2 day programme). Practical exercise to plan a media campaign and also measure performance (2 day programme). Our masterclasses are highly interactive, challenging and fun! Through discovery and also doing lots of practical exercises you’ll learn quickly! You’ll also discuss issues and produce outputs for your organisation. Take away a workbook and tool-kit of models to use in the office. This will include world class insights and ideas, also a certificate of attendance for between 7 to 14 CPD hours. I learned more in a morning that on my marketing degree course.